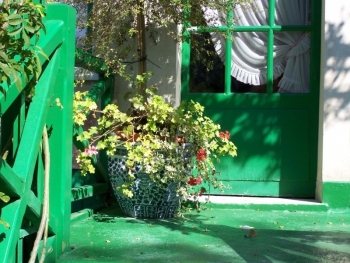 Monet’s home in Giverny has three entrances, each one dedicated to a particular use. This is typical for the time when the house was built, in the 19th century. One door was devoted to Monet’s own use. It leads directly to his first studio and to the stairs to his bedroom. It enabled Monet to go in and out without disturbing the family life – he liked to get up exceedingly early in the morning – or perhaps without being disturbed by the family life – there were eight children in the family. This entrance could be called the professional one. There was of course a main entrance for family members and guests. The third one was a domestic entrance leading directly to the kitchen.